Microbial metabolism is the means by which a microbe obtains the energy and nutrients (e.g. carbon) it needs to live and reproduce. Microbes use many different types of metabolic strategies and species can often be differentiated from each other based on metabolic characteristics. The specific metabolic properties of a microbe are the major factors in determining that microbe’s ecological niche, and often allow for that microbe to be useful in industrial processes or responsible for biogeochemical cycles. Some microbes are heterotrophic (more precisely chemoorganoheterotrophic), using organic compounds as both carbon and energy sources. Heterotrophic microbes live off of nutrients that they scavenge from living hosts (as commensals or parasites) or find in dead organic matter of all kind (saprophages). Microbial metabolism is the main contribution for the bodily decay of all organisms after death. Many eukaryotic microorganisms are heterotrophic by predation or parasitism, properties also found in some bacteria such as Bdellovibrio (an intracellular parasite of other bacteria, causing death of its victims) and Myxobacteria such as Myxococcus (predators of other bacteria which are killed and lysed by cooperating swarms of many single cells of Myxobacteria). Most pathogenic bacteria can be viewed as heterotrophic parasites of humans or the other eukaryotic species they affect. Heterotrophic microbes are extremely abundant in nature and are responsible for the breakdown of large organic polymers such as cellulose, chitin or lignin which are generally indigestible to larger animals. Generally, the breakdown of large polymers to carbon dioxide (mineralization) requires several different organisms, with one breaking down the polymer into its constituent monomers, one able to use the monomers and excreting simpler waste compounds as by-products, and one able to use the excreted wastes. There are many variations on this theme, as different organisms are able to degrade different polymers and secrete different waste products. Some organisms are even able to degrade more recalcitrant compounds such as petroleum compounds or pesticides, making them useful in bioremediation. Biochemically, prokaryotic heterotrophic metabolism is much more versatile than that of eukaryotic organisms, although many prokaryotes share the most basic metabolic models with eukaryotes, e. g. using glycolysis (also called EMP pathway) for sugar metabolism and the citric acid cycle to degrade acetate, producing energy in the form of ATP and reducing power in the form of NADH or quinols. These basic pathways are well conserved because they are also involved in biosynthesis of many conserved building blocks needed for cell growth (sometimes in reverse direction). However, many bacteria and archaea utilize alternative metabolic pathways other than glycolysis and the citric acid cycle. A well-studied example is sugar metabolism via the keto-deoxy-phosphogluconate pathway (also called ED pathway) in Pseudomonas. Moreover, there is a third alternative sugar-catabolic pathway used by some bacteria, the pentose phosphate pathway. The metabolic diversity and ability of prokaryotes to use a large variety of organic compounds arises from the much deeper evolutionary history and diversity of prokaryotes, as compared to eukaryotes. It is also noteworthy that the mitochondrion, the small membrane-bound intracellular organelle that is the site of eukaryotic energy metabolism, arose from the endosymbiosis of a bacterium related to obligate intracellular Rickettsia, and also to plant-associated Rhizobium or Agrobacterium. Therefore, it is not surprising that all mitrochondriate eukaryotes share metabolic properties with these Proteobacteria. Most microbes respire (use an electron transport chain), although oxygen is not the only terminal electron acceptor that may be used. As discussed below, the use of terminal electron acceptors other than oxygen has important biogeochemical consequences. 2). These reduced organic compounds are generally small organic acids and alcohols derived from pyruvate, the end product of glycolysis. Examples include ethanol, acetate, lactate, and butyrate. Fermentative organisms are very important industrially and are used to make many different types of food products. The different metabolic end products produced by each specific bacterial species are responsible for the different tastes and properties of each food. Not all fermentative organisms use substrate-level phosphorylation. Instead, some organisms are able to couple the oxidation of low-energy organic compounds directly to the formation of a proton (or sodium) motive force and therefore ATP synthesis. Examples of these unusual forms of fermentation include succinate fermentation by Propionigenium modestum and oxalate fermentation by Oxalobacter formigenes. These reactions are extremely low-energy yielding. Humans and other higher animals also use fermentation to produce lactate from excess NADH, although this is not the major form of metabolism as it is in fermentative microorganisms. ), and carbon dioxide CO2 initially using the enzyme methane monooxygenase. As oxygen is required for this process, all (conventional) methanotrophs are obligate aerobes. Reducing power in the form of quinones and NADH is produced during these oxidations to produce a proton motive force and therefore ATP generation. Methylotrophs and methanotrophs are not considered as autotrophic, because they are able to incorporate some of the oxidized methane (or other metabolites) into cellular carbon before it is completely oxidized to CO2 (at the level of formaldehyde), using either the serine pathway (Methylosinus, Methylocystis) or the ribulose monophosphate pathway (Methylococcus), depending on the species of methylotroph. In addition to aerobic methylotrophy, methane can also be oxidized anaerobically. This occurs by a consortium of sulfate-reducing bacteria and relatives of methanogenic Archaea working syntrophically (see below). Little is currently known about the biochemistry and ecology of this process.
) with the acetate being split between the two carbons. These acetate-cleaving organisms are the only chemoorganoheterotrophic methanogens. All autotrophic methanogens use a variation of the reductive acetyl-CoA pathway to fix CO2 and obtain cellular carbon. Syntrophy, in the context of microbial metabolism, refers to the pairing of multiple species to achieve a chemical reaction that, on its own, would be energetically unfavorable. The best studied example of this process is the oxidation of fermentative end products (such as acetate, ethanol and butyrate) by organisms such as Syntrophomonas. Alone, the oxidation of butyrate to acetate and hydrogen gas is energetically unfavorable. However, when a hydrogenotrophic (hydrogen-using) methanogen is present the use of the hydrogen gas will significantly lower the concentration of hydrogen (down to 10−5 atm) and thereby shift the equilibrium of the butyrate oxidation reaction under standard conditions (ΔGº’) to non-standard conditions (ΔG’). Because the concentration of one product is lowered, the reaction is "pulled" towards the products and shifted towards net energetically favorable conditions (for butyrate oxidation: ΔGº’= +48.2 kJ/mol, but ΔG' = -8.9 kJ/mol at 10−5 atm hydrogen and even lower if also the initially produced acetate is further metabolized by methanogens). Conversely, the available free energy from methanogenesis is lowered from ΔGº’= -131 kJ/mol under standard conditions to ΔG' = -17 kJ/mol at 10−5 atm hydrogen. This is an example of intraspecies hydrogen transfer. In this way, low energy-yielding carbon sources can be used by a consortium of organisms to achieve further degradation and eventual mineralization of these compounds. These reactions help prevent the excess sequestration of carbon over geologic time scales, releasing it back to the biosphere in usable forms such as methane and CO2. While aerobic organisms during respiration use oxygen as a terminal electron acceptor, anaerobic organisms use other electron acceptors. These inorganic compounds have a lower reduction potential than oxygen, meaning that respiration is less efficient in these organisms and leads to slower growth rates than aerobes. Many facultative anaerobes can use either oxygen or alternative terminal electron acceptors for respiration depending on the environmental conditions. Most respiring anaerobes are heterotrophs, although some do live autotrophically. All of the processes described below are dissimilative, meaning that they are used during energy production and not to provide nutrients for the cell (assimilative). Assimilative pathways for many forms of anaerobic respiration are also known. 2) by the enzymes nitrate reductase, nitrite reductase, nitric oxide reductase, and nitrous oxide reductase, respectively. Protons are transported across the membrane by the initial NADH reductase, quinones, and nitrous oxide reductase to produce the electrochemical gradient critical for respiration. Some organisms (e.g. E. coli) only produce nitrate reductase and therefore can accomplish only the first reduction leading to the accumulation of nitrite. Others (e.g. Paracoccus denitrificans or Pseudomonas stutzeri) reduce nitrate completely. Complete denitrification is an environmentally significant process because some intermediates of denitrification (nitric oxide and nitrous oxide) are important greenhouse gases that react with sunlight and ozone to produce nitric acid, a component of acid rain. Denitrification is also important in biological wastewater treatment where it is used to reduce the amount of nitrogen released into the environment thereby reducing eutrophication. 2S) is produced as a metabolic end product. For sulfate reduction electron donors and energy are needed. 3) and AMP. In organisms that use carbon compounds as electron donors, the ATP consumed is accounted for by fermentation of the carbon substrate. The hydrogen produced during fermentation is actually what drives respiration during sulfate reduction. 2) as an electron donor and carbon dioxide (CO2) as an electron acceptor to produce acetate, the same electron donors and acceptors used in methanogenesis (see above). Bacteria that can autotrophically synthesize acetate are called homoacetogens. Carbon dioxide reduction in all homoacetogens occurs by the acetyl-CoA pathway. This pathway is also used for carbon fixation by autotrophic sulfate-reducing bacteria and hydrogenotrophic methanogens. Often homoacetogens can also be fermentative, using the hydrogen and carbon dioxide produced as a result of fermentation to produce acetate, which is secreted as an end product.
) is a widespread anaerobic terminal electron acceptor both for autotrophic and heterotrophic organisms. Electron flow in these organisms is similar to those in electron transport, ending in oxygen or nitrate, except that in ferric iron-reducing organisms the final enzyme in this system is a ferric iron reductase. Model organisms include Shewanella putrefaciens and Geobacter metallireducens. Since some ferric iron-reducing bacteria (e.g. G. metallireducens) can use toxic hydrocarbons such as toluene as a carbon source, there is significant interest in using these organisms as bioremediation agents in ferric iron-rich contaminated aquifers. TMAO is a chemical commonly produced by fish, and when reduced to TMA produces a strong odor. DMSO is a common marine and freshwater chemical which is also odiferous when reduced to DMS. Reductive dechlorination is the process by which chlorinated organic compounds are reduced to form their non-chlorinated endproducts. As chlorinated organic compounds are often important (and difficult to degrade) environmental pollutants, reductive dechlorination is an important process in bioremediation. Chemolithotrophy is a type of metabolism where energy is obtained from the oxidation of inorganic compounds. Most chemolithotrophic organisms are also autotrophic. There are two major objectives to chemolithotrophy: the generation of energy (ATP) and the generation of reducing power (NADH). 2) as a source of energy. While several mechanisms of anaerobic hydrogen oxidation have been mentioned previously (e.g. sulfate reducing- and acetogenic bacteria), hydrogen can also be used as an energy source aerobically. In these organisms, hydrogen is oxidized by a membrane-bound hydrogenase causing proton pumping via electron transfer to various quinones and cytochromes. In many organisms, a second cytoplasmic hydrogenase is used to generate reducing power in the form of NADH, which is subsequently used to fix carbon dioxide via the Calvin cycle. Hydrogen-oxidizing organisms, such as Cupriavidus necator (formerly Ralstonia eutropha), often inhabit oxic-anoxic interfaces in nature to take advantage of the hydrogen produced by anaerobic fermentative organisms while still maintaining a supply of oxygen. 3) as a terminal electron acceptor and therefore grow anaerobically. 3). There are three distinct types of ferrous iron-oxidizing microbes. The first are acidophiles, such as the bacteria Acidithiobacillus ferrooxidans and Leptospirillum ferrooxidans, as well as the archaeon Ferroplasma. These microbes oxidize iron in environments that have a very low pH and are important in acid mine drainage. The second type of microbes oxidize ferrous iron at cirum-neutral pH. These micro-organisms (for example Gallionella ferruginea, Leptothrix ochracea, or Mariprofundus ferrooxydans) live at the oxic-anoxic interfaces and are microaerophiles. The third type of iron-oxidizing microbes are anaerobic photosynthetic bacteria such as Rhodopseudomonas, which use ferrous iron to produce NADH for autotrophic carbon dioxide fixation. Biochemically, aerobic iron oxidation is a very energetically poor process which therefore requires large amounts of iron to be oxidized by the enzyme rusticyanin to facilitate the formation of proton motive force. Like sulfur oxidation, reverse electron flow must be used to form the NADH used for carbon dioxide fixation via the Calvin cycle. 2OH) by the enzyme ammonia monooxygenase in the cytoplasm, followed by the oxidation of hydroxylamine to nitrite by the enzyme hydroxylamine oxidoreductase in the periplasm. Electron and proton cycling are very complex but as a net result only one proton is translocated across the membrane per molecule of ammonia oxidized. Nitrite reduction is much simpler, with nitrite being oxidized by the enzyme nitrite oxidoreductase coupled to proton translocation by a very short electron transport chain, again leading to very low growth rates for these organisms. Oxygen is required in both ammonia and nitrite oxidation, meaning that both nitrosifying and nitrite-oxidizing bacteria are aerobes. As in sulfur and iron oxidation, NADH for carbon dioxide fixation using the Calvin cycle is generated by reverse electron flow, thereby placing a further metabolic burden on an already energy-poor process. In 2015, two groups independently showed the microbial genus Nitrospira is capable of complete nitrification (Comammox). 4 — rocket fuel) is produced as an intermediate during anammox metabolism. To deal with the high toxicity of hydrazine, anammox bacteria contain a hydrazine-containing intracellular organelle called the anammoxasome, surrounded by highly compact (and unusual) ladderane lipid membrane. These lipids are unique in nature, as is the use of hydrazine as a metabolic intermediate. Anammox organisms are autotrophs although the mechanism for carbon dioxide fixation is unclear. Because of this property, these organisms could be used to remove nitrogen in industrial wastewater treatment processes. Anammox has also been shown have widespread occurrence in anaerobic aquatic systems and has been speculated to account for approximately 50% of nitrogen gas production in the ocean.
) can also be used by some organisms. Phylogenetically, all oxygenic photosynthetic bacteria are Cyanobacteria, while anoxygenic photosynthetic bacteria belong to the purple bacteria (Proteobacteria), Green sulfur bacteria (e.g. Chlorobium), Green non-sulfur bacteria (e.g. Chloroflexus), or the heliobacteria (Low %G+C Gram positives). In addition to these organisms, some microbes (e.g. the Archaeon Halobacterium or the bacterium Roseobacter, among others) can utilize light to produce energy using the enzyme bacteriorhodopsin, a light-driven proton pump. However, there are no known Archaea that carry out photosynthesis. As befits the large diversity of photosynthetic bacteria, there are many different mechanisms by which light is converted into energy for metabolism. All photosynthetic organisms locate their photosynthetic reaction centers within a membrane, which may be invaginations of the cytoplasmic membrane (Proteobacteria), thylakoid membranes (Cyanobacteria), specialized antenna structures called chlorosomes (Green sulfur and non-sulfur bacteria), or the cytoplasmic membrane itself (heliobacteria). Different photosynthetic bacteria also contain different photosynthetic pigments, such as chlorophylls and carotenoids, allowing them to take advantage of different portions of the electromagnetic spectrum and thereby inhabit different niches. Some groups of organisms contain more specialized light-harvesting structures (e.g. phycobilisomes in Cyanobacteria and chlorosomes in Green sulfur and non-sulfur bacteria), allowing for increased efficiency in light utilization. Biochemically, anoxygenic photosynthesis is very different from oxygenic photosynthesis. Cyanobacteria (and by extension, chloroplasts) use the Z scheme of electron flow in which electrons eventually are used to form NADH. Two different reaction centers (photosystems) are used and proton motive force is generated both by using cyclic electron flow and the quinone pool. In anoxygenic photosynthetic bacteria, electron flow is cyclic, with all electrons used in photosynthesis eventually being transferred back to the single reaction center. A proton motive force is generated using only the quinone pool. In heliobacteria, Green sulfur, and Green non-sulfur bacteria, NADH is formed using the protein ferredoxin, an energetically favorable reaction. In purple bacteria, NADH is formed by reverse electron flow due to the lower chemical potential of this reaction center. In all cases, however, a proton motive force is generated and used to drive ATP production via an ATPase. Most photosynthetic microbes are autotrophic, fixing carbon dioxide via the Calvin cycle. Some photosynthetic bacteria (e.g. Chloroflexus) are photoheterotrophs, meaning that they use organic carbon compounds as a carbon source for growth. Some photosynthetic organisms also fix nitrogen (see below). 3), which is easily assimilated by all organisms. These prokaryotes, therefore, are very important ecologically and are often essential for the survival of entire ecosystems. This is especially true in the ocean, where nitrogen-fixing cyanobacteria are often the only sources of fixed nitrogen, and in soils, where specialized symbioses exist between legumes and their nitrogen-fixing partners to provide the nitrogen needed by these plants for growth. 2 fixed) and due to the extreme sensitivity of the nitrogenase to oxygen. ↑ DiMarco AA, Bobik TA, Wolfe RS (1990). "Unusual coenzymes of methanogenesis". Annu. Rev. Biochem. 59: 355–94. doi:10.1146/annurev.bi.59.070190.002035. PMID 2115763. ↑ Ishimoto M, Koyama J, Nagai Y (September 1954). "Biochemical Studies on Sulfate-Reducing Bacteria: IV. The Cytochrome System of Sulfate-Reducing Bacteria". J Biochem. 41 (6): 763–70. ↑ Mizuno O, Li YY, Noike T (May 1998). "The behavior of sulfate-reducing bacteria in acidogenic phase of anaerobic digestion". Water Research. 32 (5): 1626–34. doi:10.1016/S0043-1354(97)00372-2. ↑ Schink B, Thiemann V, Laue H, Friedrich MW (May 2002). "Desulfotignum phosphitoxidans sp. nov., a new marine sulfate reducer that oxidizes phosphite to phosphate". Arch Microbiol. 177 (5): 381–91. doi:10.1007/s00203-002-0402-x. PMID 11976747. ↑ Jackson BE, McInerney MJ (August 2000). "Thiosulfate Disproportionation by Desulfotomaculum thermobenzoicum". Appl Environ Microbiol. 66 (8): 3650–3. doi:10.1128/AEM.66.8.3650-3653.2000. PMC 92201 . PMID 10919837. 1 2 Kappler U, Bennett B, Rethmeier J, Schwarz G, Deutzmann R, McEwan AG, Dahl C (May 2000). "Sulfite:Cytochrome c Oxidoreductase from Thiobacillus novellus. Purification, Characterization, and Molecular Biology of a Heterodimeric Member of the Sulfite Oxidase Family". J Biol Chem. 275 (18): 13202–12. doi:10.1074/jbc.275.18.13202. PMID 10788424. ↑ Jiao Y, Kappler A, Croal LR, Newman DK (August 2005). "Isolation and Characterization of a Genetically Tractable Photoautotrophic Fe(II)-Oxidizing Bacterium, Rhodopseudomonas palustris Strain TIE-1". Appl Environ Microbiol. 71 (8): 4487–96. doi:10.1128/AEM.71.8.4487-4496.2005. PMC 1183355 . PMID 16085840. ↑ van Kessel, Maartje A. H. J.; Speth, Daan R.; Albertsen, Mads; Nielsen, Per H.; Op den Camp, Huub J. M.; Kartal, Boran; Jetten, Mike S. M.; Lücker, Sebastian (2015-12-24). "Complete nitrification by a single microorganism". Nature. 528 (7583): 555–559. doi:10.1038/nature16459. ISSN 0028-0836. ↑ Daims, Holger; Lebedeva, Elena V.; Pjevac, Petra; Han, Ping; Herbold, Craig; Albertsen, Mads; Jehmlich, Nico; Palatinszky, Marton; Vierheilig, Julia (2015-12-24). "Complete nitrification by Nitrospira bacteria". Nature. 528 (7583): 504–509. doi:10.1038/nature16461. ISSN 0028-0836. ↑ Strous M, Fuerst JA, Kramer EH, et al. (July 1999). "Missing lithotroph identified as new planctomycete". Nature. 400 (6743): 446–9. doi:10.1038/22749. PMID 10440372. ↑ Zhu G, Peng Y, Li B, Guo J, Yang Q, Wang S (2008). "Biological removal of nitrogen from wastewater". Rev Environ Contam Toxicol. Reviews of Environmental Contamination and Toxicology. 192: 159–95. doi:10.1007/978-0-387-71724-1_5. ISBN 978-0-387-71723-4. PMID 18020306. ↑ Op den Camp HJ (February 2006). "Global impact and application of the anaerobic ammonium-oxidizing (anammox) bacteria". Biochem Soc Trans. 34 (Pt 1): 174–8. doi:10.1042/BST0340174. PMID 16417514. ↑ Gräber, Peter; Milazzo, Giulio (1997). Bioenergetics. Birkhäuser. p. 80. ISBN 978-3-7643-5295-0. 1 2 Bryant DA, Frigaard NU (November 2006). 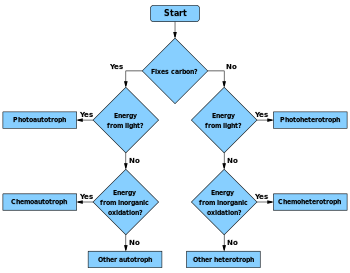 "Prokaryotic photosynthesis and phototrophy illuminated". Trends Microbiol. 14 (11): 488–96. doi:10.1016/j.tim.2006.09.001. PMID 16997562. ↑ McFadden G (1999). "Endosymbiosis and evolution of the plant cell". Curr Opin Plant Biol. 2 (6): 513–9. doi:10.1016/S1369-5266(99)00025-4. PMID 10607659. ↑ Cabello P, Roldán MD, Moreno-Vivián C (November 2004). "Nitrate reduction and the nitrogen cycle in archaea". Microbiology (Reading, Engl.). 150 (Pt 11): 3527–46. doi:10.1099/mic.0.27303-0. PMID 15528644. Madigan,, Michael T.; Martinko, John M. (2005). Brock Biology of Microorganisms. Pearson Prentice Hall.